Last month I had to get out of town! 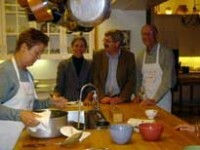 I had leant my house to friends for two parties: one Saturday evening and the other Sunday morning. What to do? I called my friend Caroline to see if I could rent her guesthouse. Not only did I get to stay in a charming house with swimming pool, she and her husband hosted me for dinner on Saturday night. Along with pasta and salad, we ate a truly delicious dish of chicken and herbs wrapped in prosciutto. 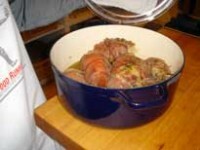 This is an old recipe of Giuliano Bugiali’s, which I have adapted for you. 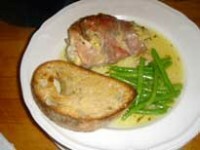 It is easy to make ahead and serve with toasted or grilled garlic bread and little green beans. To find out how you can rent this special guesthouse in the south end of the Napa Valley check out www.CarolinesGetaway.com. Melt the butter in a small saucepan. 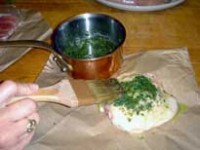 Stir in the minced herbs with a tiny sprinkling of salt and pepper. 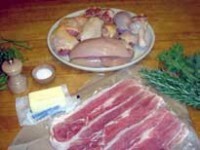 Paint each piece of chicken on both sides with the herb mixture and wrap each piece in a slice of prosciutto. 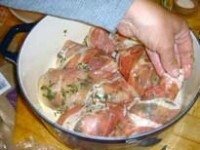 Place the chicken pieces in the bottom of a heavy pot, cover, and place in a preheated 350 degree oven for about 1 hour. Serve on warm plates with plenty of juices.